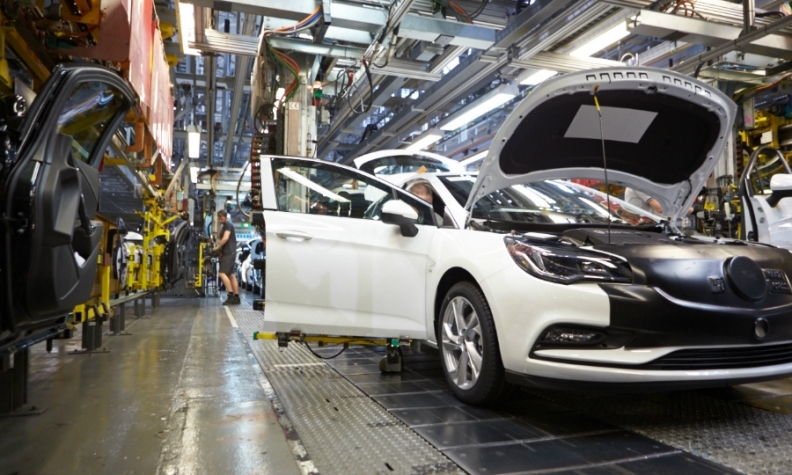 The Astra compact, built in Ellesmere Port, England, could face export tariffs into the EU. BERLIN -- PSA Group is pushing the UK factories it acquired as part of its deal for General Motors's European operations to make a leap in competitiveness to offset the potential risks posed by Brexit. British Vauxhall plants, where production costs are about twice as high as the French automaker's domestic sites, face hurdles in either a hard or soft Brexit scenario, PSA CEO Carlos Tavares said in an interview in Berlin. If the UK reaches a trade deal with the European Union, the plants will need to be competitive with facilities in continental Europe. Without a trade agreement, they will need to vie with factories overseas, he said in the interview at a conference held by Automobilwoche, a sister publication of Automotive News Europe. Reviving the Vauxhall nameplate is probably the biggest challenge in PSA's ambitious turnaround of GM's former European operations, which were purchased earlier this year in a 2.2 billion-euro ($2.6 billion) deal. While the plan includes prospects to export Opel vehicles into more than 20 new markets, Vauxhall remains relegated to the UK, raising questions about its future. PSA has already said it plans to cut 400 jobs, about a quarter of the workforce, at Vauxhall's plant in Ellesmere Port in northwest England, which builds Astra compact models. The automaker said last month that the factory must also improve its performance to protect its future. The cuts will be made through voluntary layoffs. "Dump the Vauxhall brand," Max Warburton, an analyst with Sanford C. Bernstein, said in a Thursday note. "Even the most jingoistic Brexiteers would rather buy a German car. There's no room for a one-market brand in 2017." Tavares disagrees, arguing that there is value in developing the marque around its long heritage to reconnect with British consumers. "I consider Vauxhall as an asset and not a penalty," Tavares said. "I don't see there's a risk that Vauxhall doesn't stay." Vauxhall was founded in 1857 and began manufacturing cars in 1903. Since the 1980s, the cars are largely identical with the German engineered and designed Opel models. In addition to the Ellesmere Port site, Vauxhall also has a plant in Luton, near London, that makes vans. While Vauxhall's future has yet to be mapped out, a revival could include reversing years of re-badging Opel cars with the British marque's griffin logo. "Nothing is taboo, including differentiation," Tavares said, adding that the guiding principle is that "we make money," a rarity for the operation under GM's ownership in recent years. PSA aims to change that by reducing Opel and Vauxhall's production costs by 700 euros per car by 2020 to generate an operating profit margin of 2 percent. Unlike many restructuring plans in the auto industry, the company is not relying on growth to fix its problems. Instead, Opel's effort will largely mirror PSA's own revamp under Tavares, who transformed an industry laggard squeezed by bloated costs into one of Europe's most profitable mass-market manufacturers. Tavares, 59, eliminated unnecessary expenses and focused the company on its most lucrative models, ceding market share in the process. In acquiring Opel, PSA doubled down on Europe's saturated market. While relying on the region without a strong presence abroad is a risk, it forces PSA to compete and the carmaker can still make "tons of money" on its home turf, Tavares said. Strong European operations provide the platform for expansion elsewhere, he said.